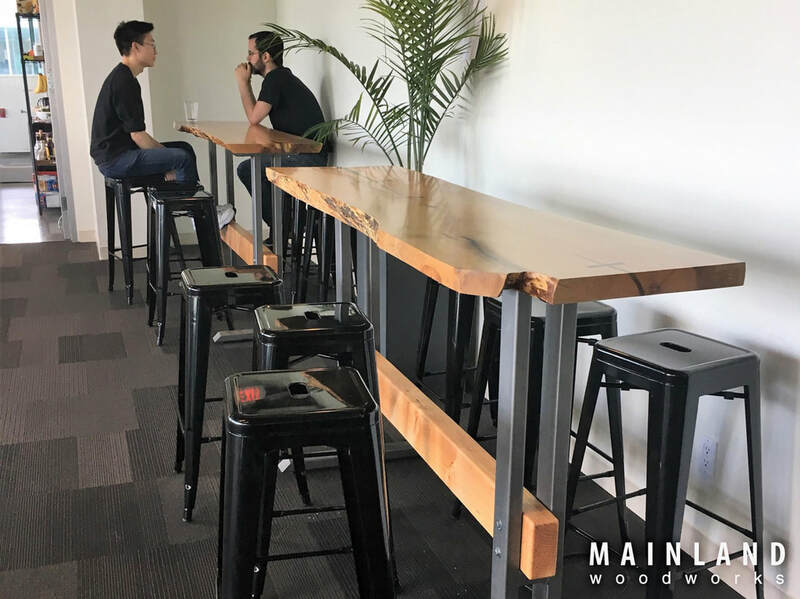 I Recently delivered a pair of bar height maple slab tables to East Side Games, in Vancouver. 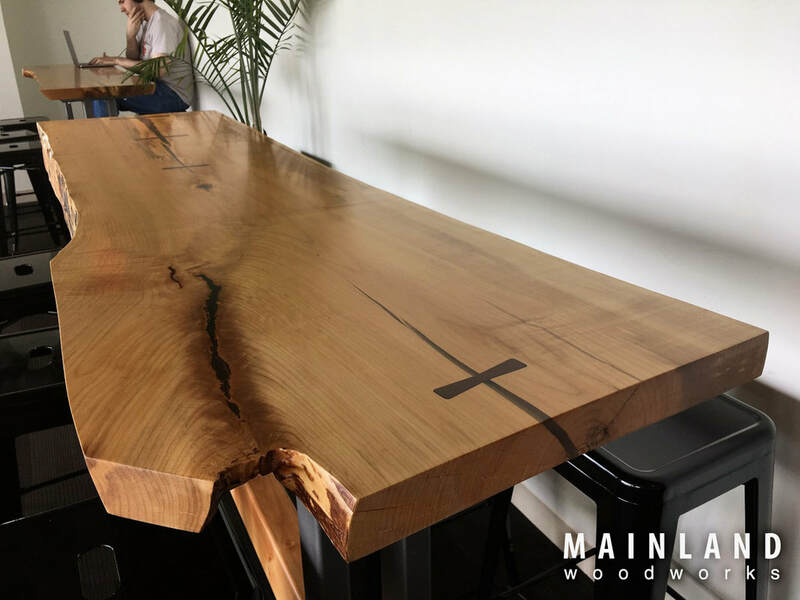 These tables were made from bookmatched slabs milled on Sumas mountain. The tree fell in a windstorm, 5 years ago now, and knocked down the powerline to my father-in-laws' shop, nearly starting a fire. 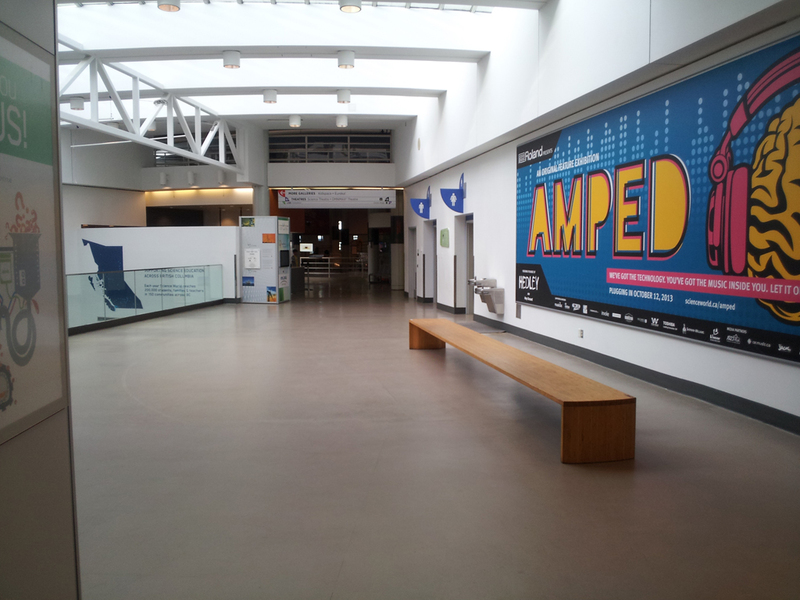 Luckily people were around to notice and shut off the power before it got out of control. 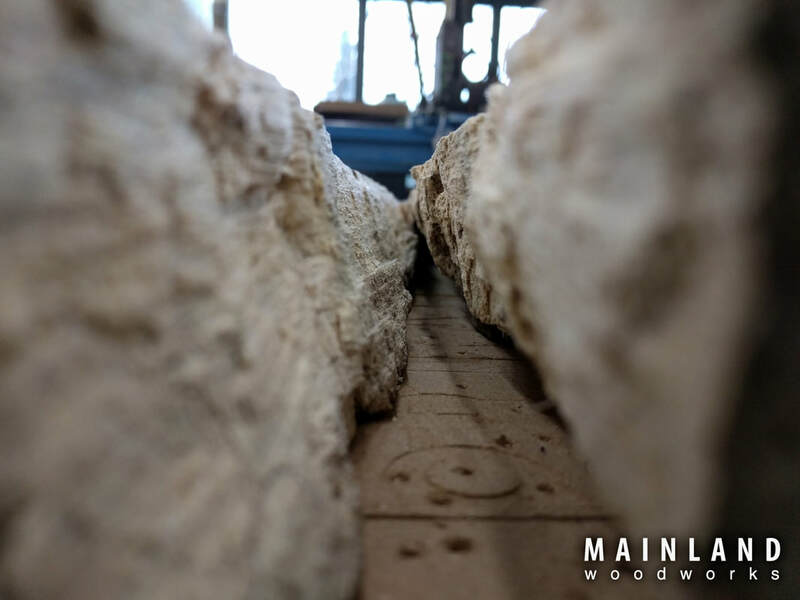 we milled up the logs, stacked them, and let them air dry over the last 4 years until the right project came along to use it. 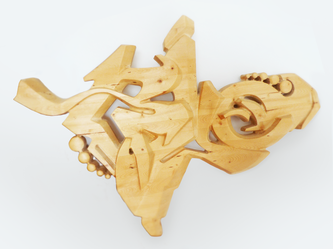 This is a 3D model of the rough original design that I proposed for the tables. 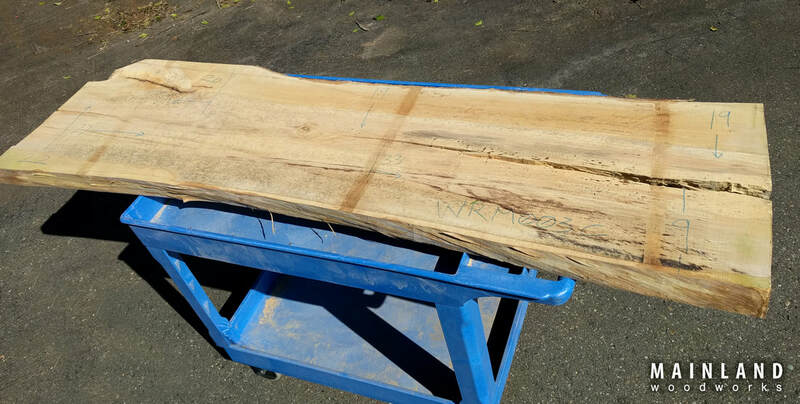 And here are the slabs I pulled from the saw mill drying racks. 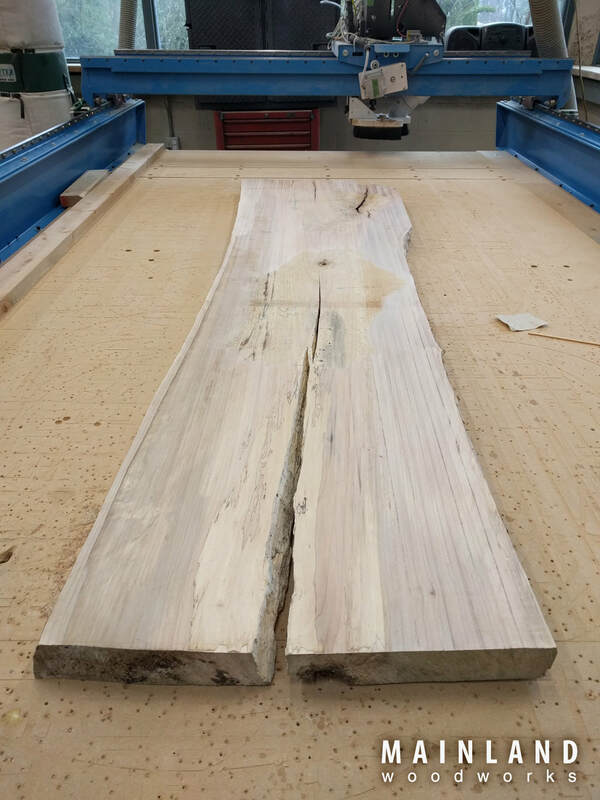 These slabs were chosen because I really liked that they were sequential from the log. So they would really make a nice pair. Also the big cracks posed an interesting challenge to fill and stabilize. 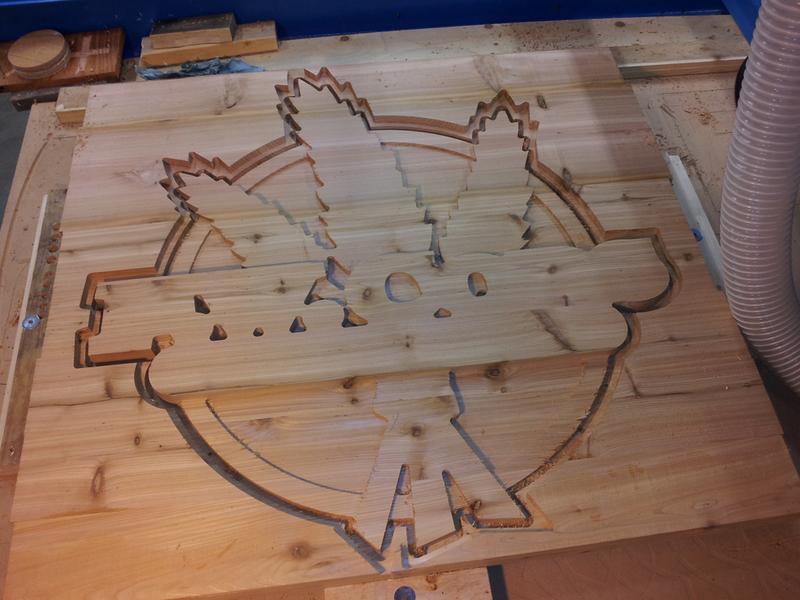 First pass of rough planing on the CNC machine to get some reference flatness. 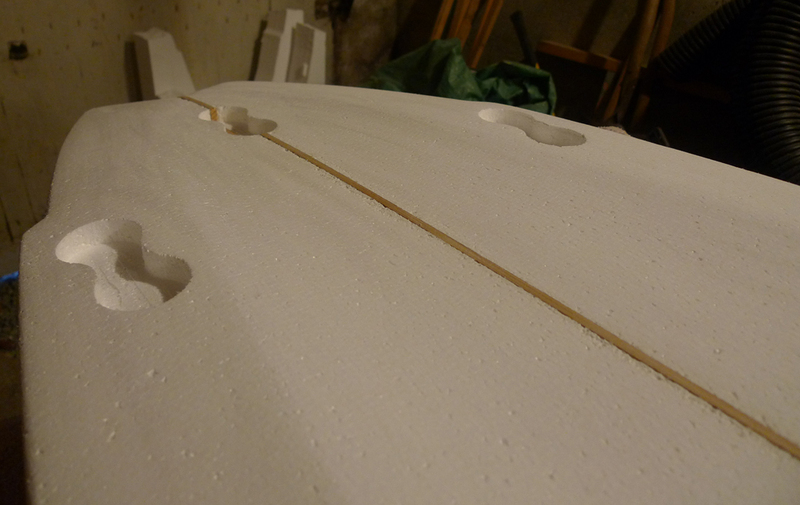 After Rough Planing the slabs down to a reference flat, I prepared the cracks to be filled with epoxy. I chose to use System 3's Mirror Coat for this one. Here they are after a few more steps, these have now been filled with epoxy, and Brazilian Ipe, or Ironwood was used for the bowties to stabilize the cracks. 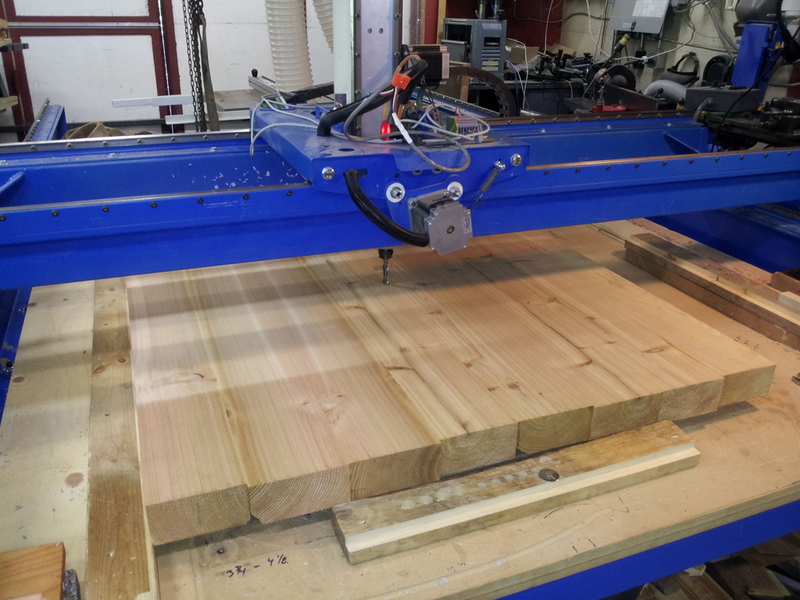 I then used the CNC machine to again plane down the slabs to their matching, finished thickness. After many hours of sanding to perfection they were ready for finishing. 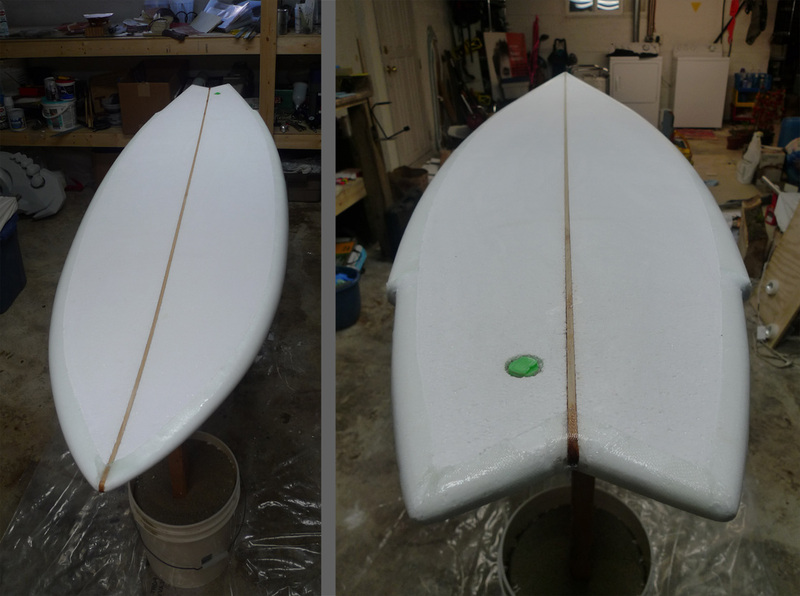 I used the Minwax Helmsman, a spar urethane. I chose this for it's durability and UV stability. After many sprayed coats of urethane, and light sanding over the span of 4 days, they look perfect! 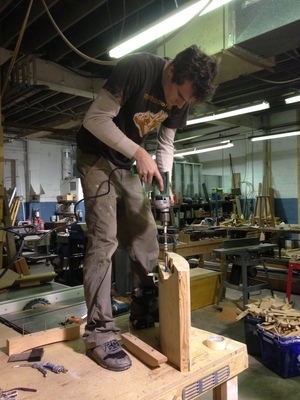 Next, the Legs were fabricated by another shop, I then had them wheelabrated. I really like the textured finish that this brings to the raw steel. They were then clear-coated and ready for assembly. All finished and initial assembly complete, now time to disassemble them and deliver them to their new home at East Side Games. All done. I'm really happy with how these turned out. 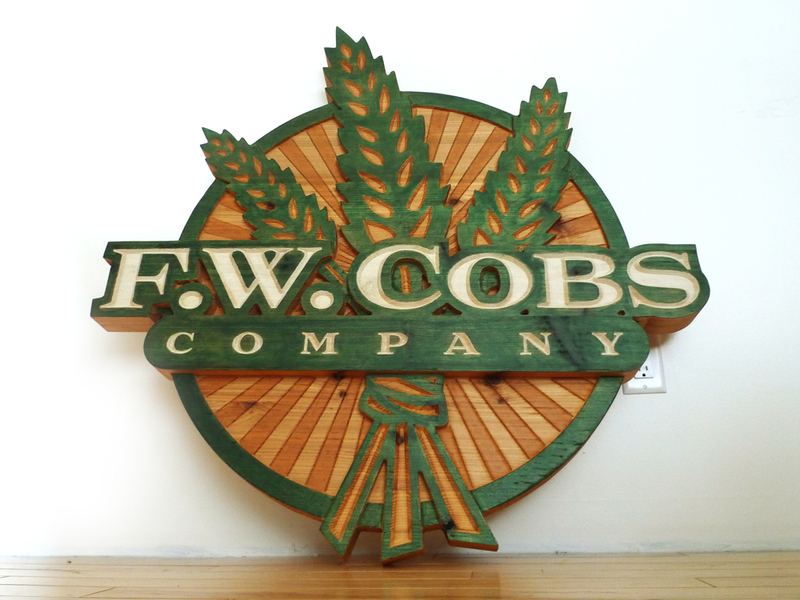 Recently I completed a project that has been on the side burner for some time now. 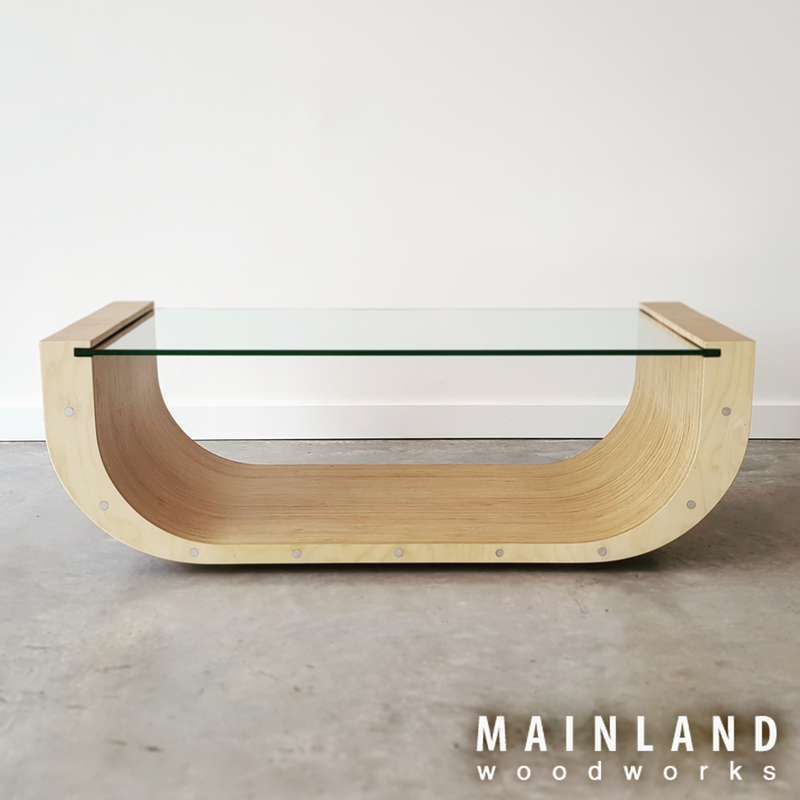 This is a coffee table made from laminating CNC cut pieces of baltic birch plywood, from a single 4' x 8' sheet. It measures 20" x 47" and 15 5/8" tall, to the glass. 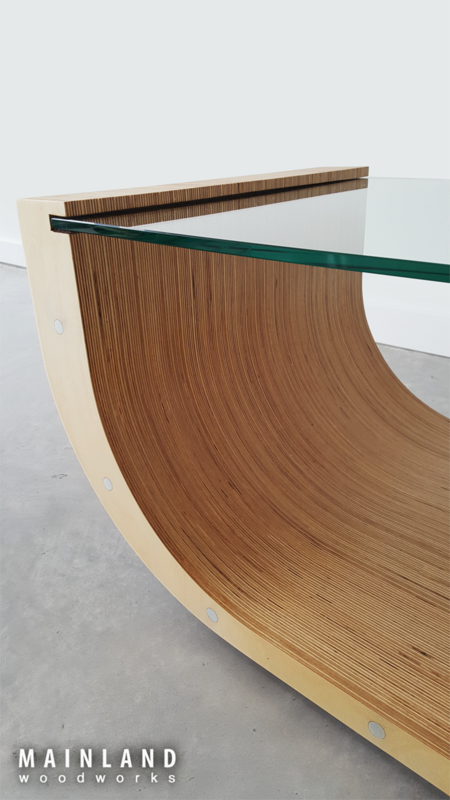 With the half pipe shape and the laminated layers like a skateboard deck the design inspiration comes from skateboarding and half pipe ramps. Also I love jewellery ring tension settings, where the gem is held in captive tension by the body. The shape is fun, and playful, yet classy and clean. the kids have played with TechDeck skateboards and hot wheels cars on the transition, it's really fun, and I really like how it hovers above the ground. using 10mm thick tempered glass, it's beautiful, durable, and safe. Even with kids playing under it, or standing on it.. 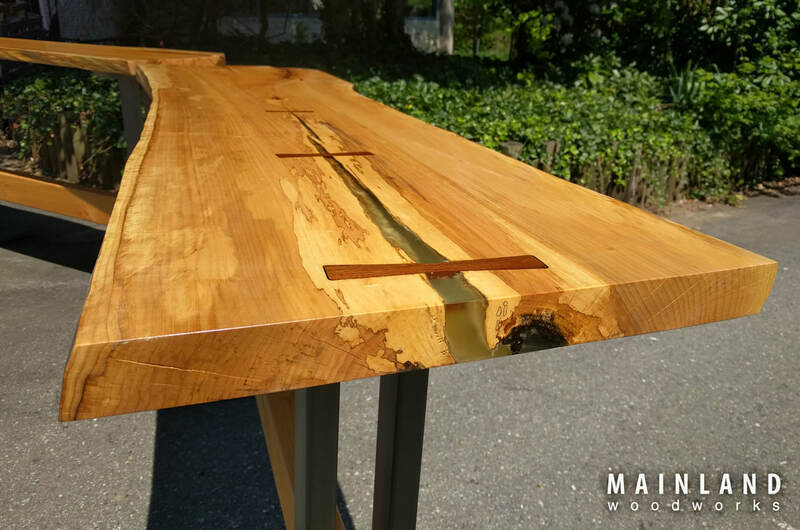 I will be taking orders to create more of these tables in the very near future. 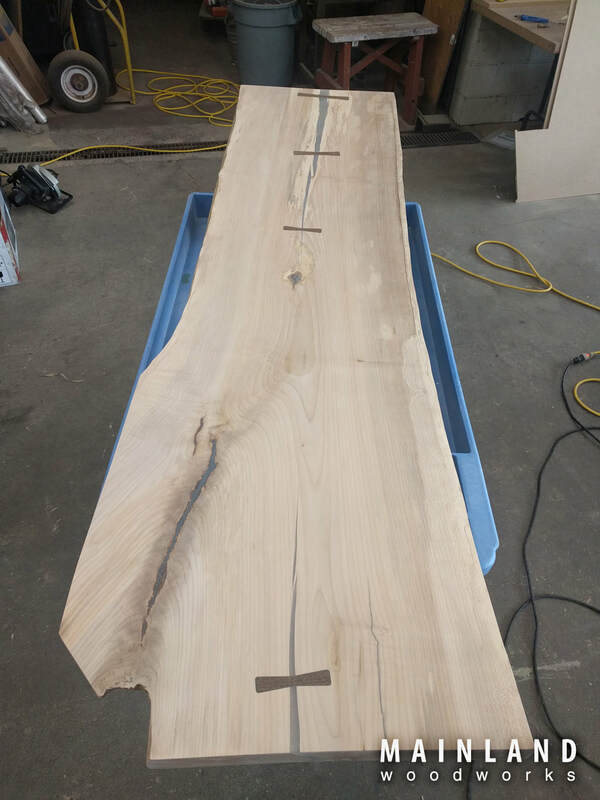 Please send us an email if you would like your name on the list for a custom table like this one. 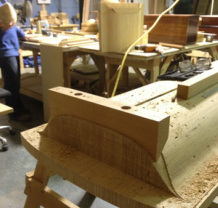 I can make custom adjustments to width and length if needed. Click here to get your name on the list! 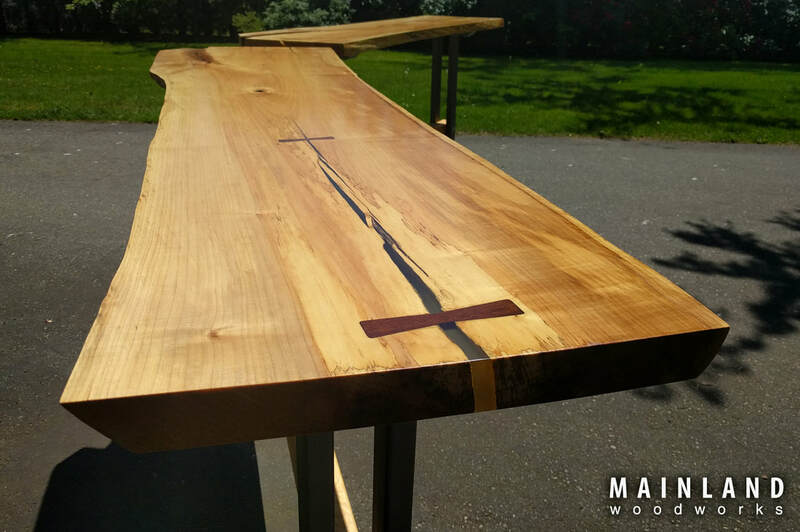 Or send us an email at Mainlandwoodworks@gmail.com and put HALF PIPE COFFEE in the subject line! 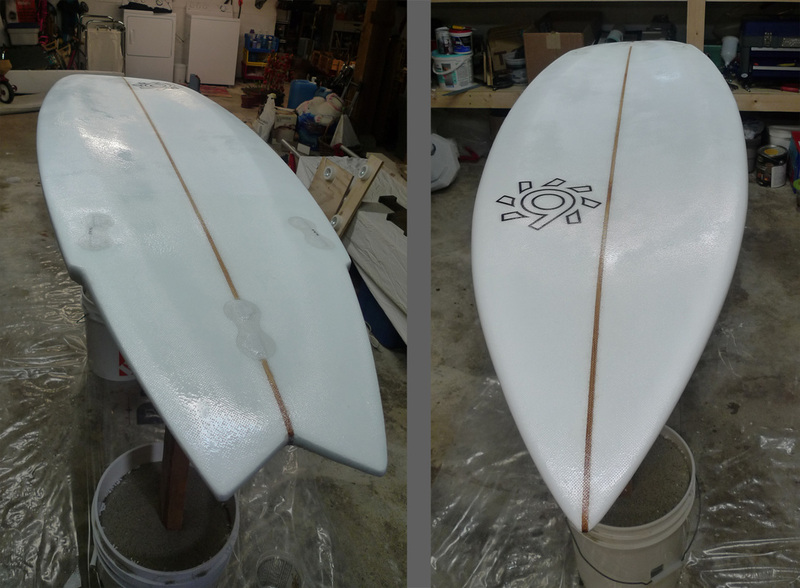 Next is on to painting the board. 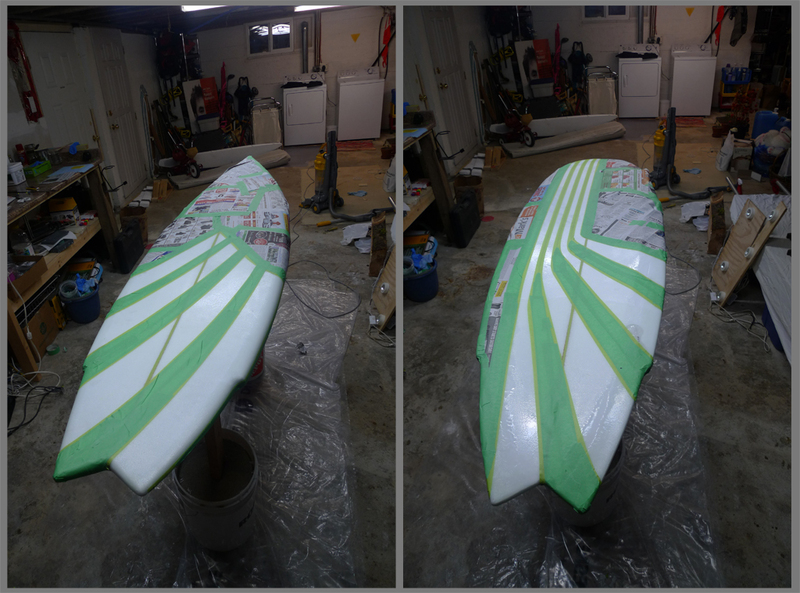 I decide to paint under the fill coat/ hot coat of epoxy. I'm not sure if that's the best thing to do. but it worked. However, next time I would definitely spend a lot more time sanding the lamination layers smooth before painting. The first step I took was blocking out the shapes with 1/2" masking tape. The rest is just a step by step of masking, painting, removing the masking, and over again. 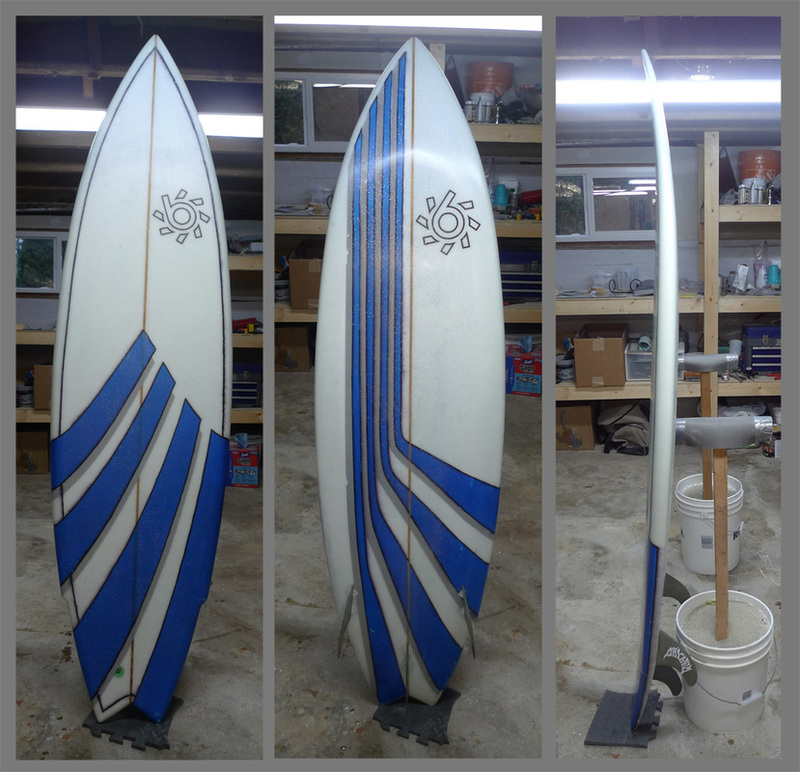 here it is all painted up and ready for the hotcoat. I added a small amount of glitter to the hotcoat epoxy mix, to see how it turned out. and it's not bad, though I think next time I will plan on using a lot more of it but in smaller areas. In a few places I sanded through the hotcoat and into the paint. but it doesnt matter too much, it's just cosmetic. 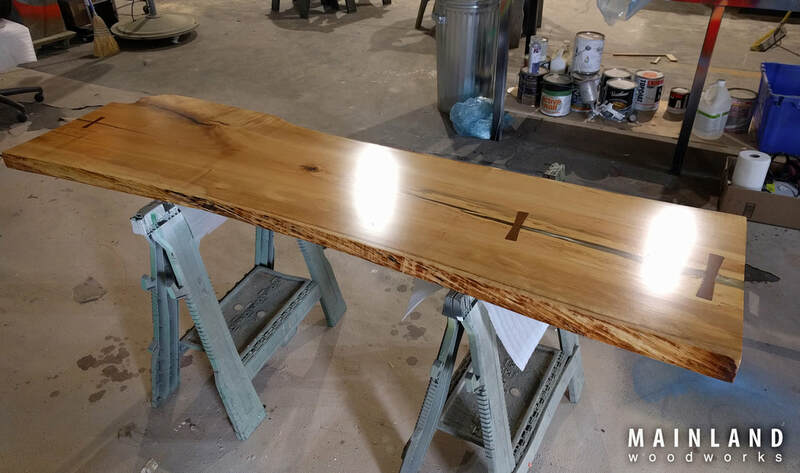 lastly, I put the final coat of epoxy, the gloss coat, and polished it up. For the pin-lines, I found that using the sharpie brand paint pen was easy to use, but the additive F in the epoxy, which contains Xylene, made the black lines weep and leak in the hotcoat. Next time I'll look for a better paint pen, or paint on top of the gloss coat. Then the last, last thing to do was to grind open the finboxes and the leashcup. 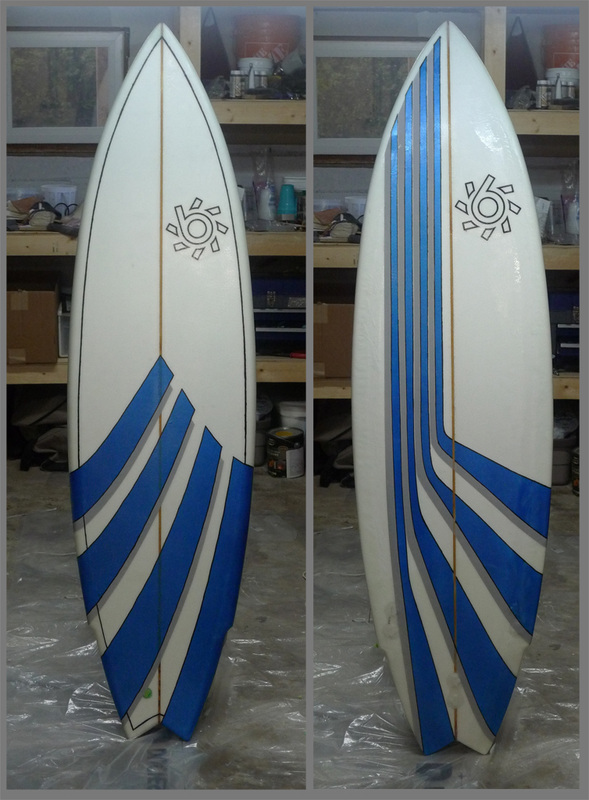 and that is that, I made a surfboard. I like it. Now I just have to wait for the opportunity to put it in the water. 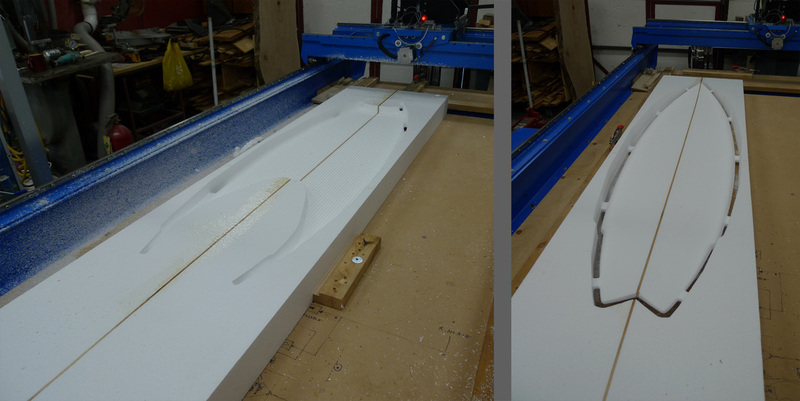 In the previous post, I went through the first steps of making the stock blank, and machining the board from that. Then finishing with a light sanding to get the shape just perfect for glassing. This post will cover the glassing stages. The saying goes " There are a thousand things that could go wrong when glassing, and at least one or two will. " I made it out pretty lucky in this regard, I only missed my resin volume estimate on the bottom of the board and did not mix enough epoxy, so I had to mix another batch, and then another.. it seems that CNC machined EPS foam tears out some of the little pellets of foam leaving a lot of little pockets, in one regard this is terrible as the board just will never look perfect close up, but on the other hand, those pockets create really strong grab points for the epoxy to really get hold of the foam. here's a detail of what I'm talking about, you can see all the little pock marks where the foam pellets tore out. Alright, on to the glass. 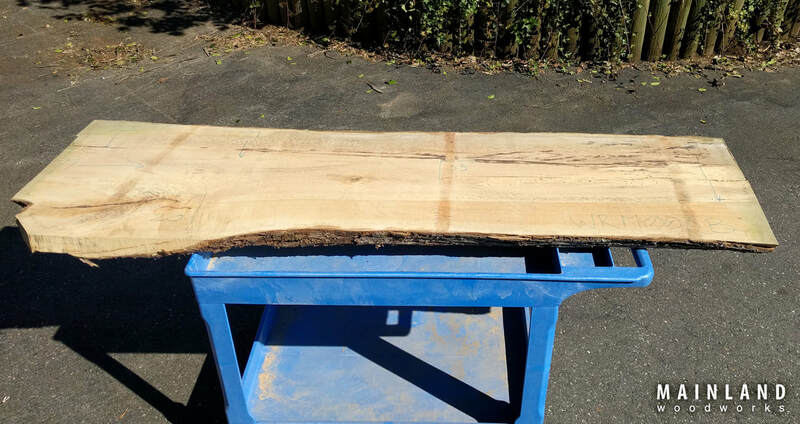 I wanted to do a cut lap for the bottom layer, so the first step is to establish where that cut will take place. tape off a line that will later be the cutting line, and add those little crumpled balls of tape to make sure the drip edge formed by the hanging part of the tape stays free from the boards surface. 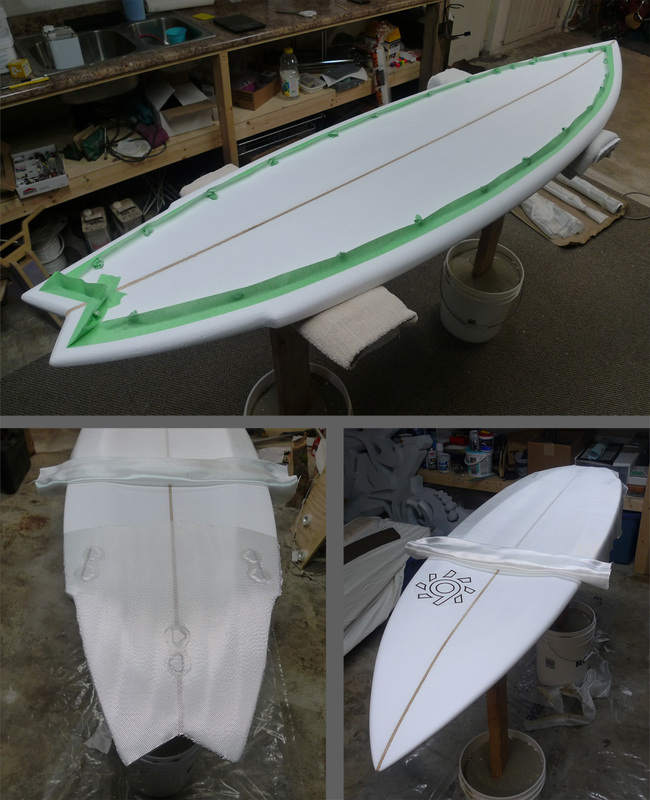 Then the board is flipped over, layout the cloth and trim it to width. Here you have to make sure to allow for enough glass to make it to your tape line, but not too much more. I used 6oz cloth for all my laminations. 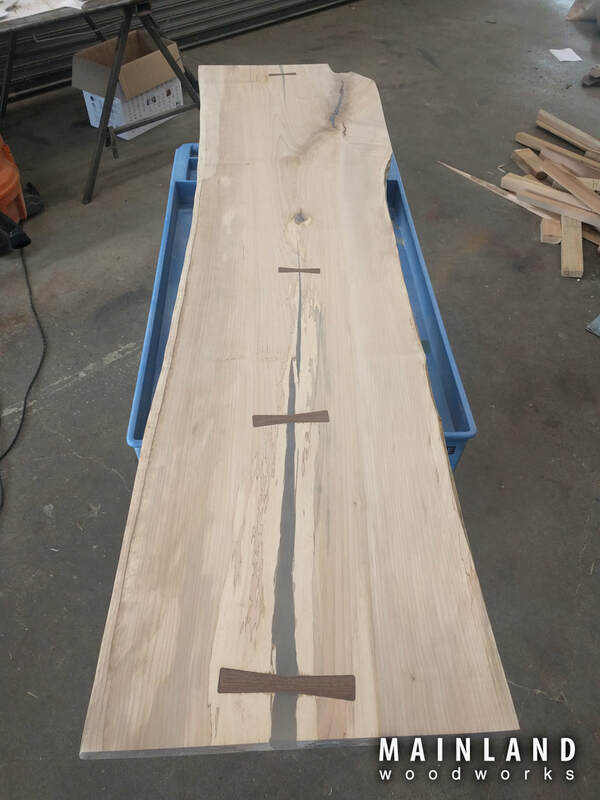 On this board I went with a full tail patch, they say you can use "football sized" pieces to do the same job, but I thought this was a cleaner approach. 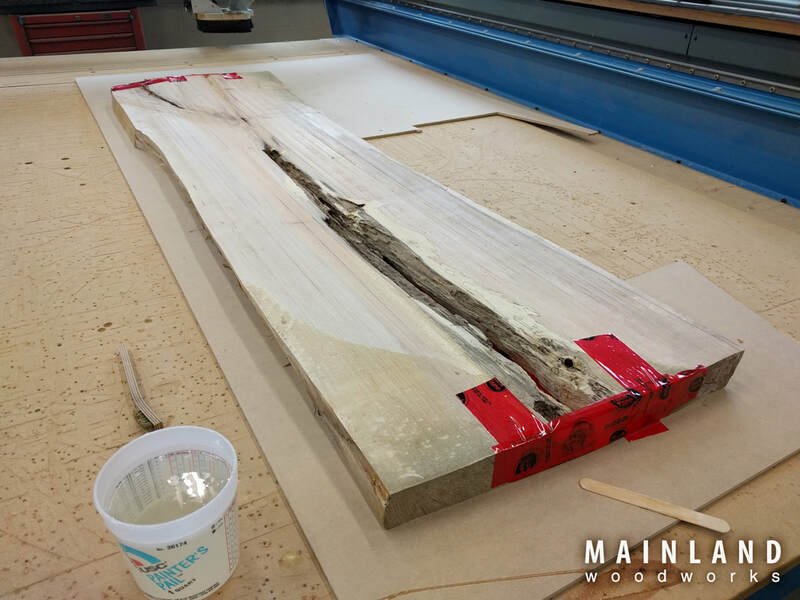 The patch is cut flush with the edge of the board, and goes under the full sheet. I decided to take the same logo from my children's pushbikes and put it on any boards I make too. so the "b" Logo was laser printed on rice paper and cut out. Everything I read was that you "must use Inkjet" but I found the laser printer works perfectly fine. perhaps the warning was that you didn't need to use Laser? or maybe when using polyester resin laser printed art bleeds? I'm not sure. But laser printed rice paper and epoxy work fine together. 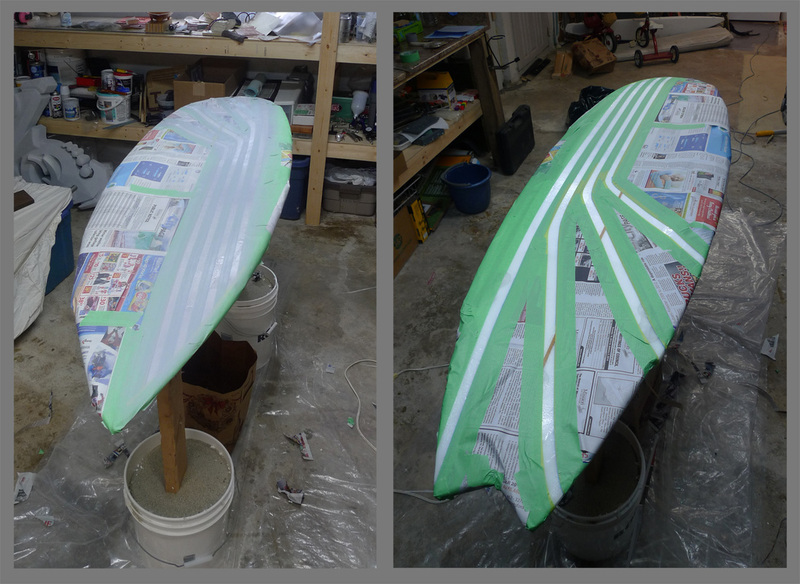 I used the Resin Research brand surfboard epoxy. Here's what the underside looked like after 40 minutes of babysitting. I found that where the glass was a lot longer it was a pain to get it to stick to the underside of the board, the hanging parts were just too heavy when saturated with resin to stick. Subsequently, I got a few small air bubbles under there that I would have rather avoided. lesson is, cut the glass a little closer to the tape line next time. There we have it, the bottom is glassed. next, onto the topside. 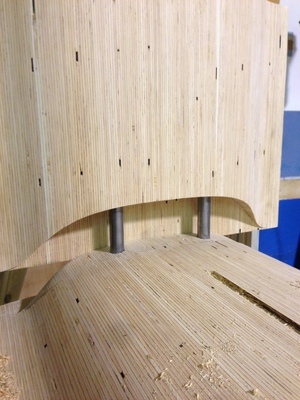 here's a detail of the cutlap after trimming and removing the tape. it wasn't a clean "zipcut" as it is sometimes called, but it worked. The key here is waiting the exact right amount of time before you trim the excess, too long and it's really tough to cut through, not long enough and it gums up the razor blade. I've also decided to put the leash plug under the glass. it apparently makes no difference, installing it pre glass or after, but, this way just seemed like a stronger connection to me. 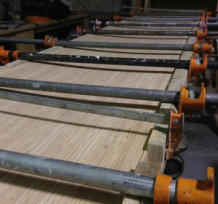 and next glassing the top laminations. on the top I went with 2 layers of 6oz. seemed like the standard thing to do from the research I have been doing. The decal, again laser printed on rice paper and it goes under the top layer of glass only. I'm looking pretty stoked about all this work. This project literally kept me up at night, thinking and being excited about moving onto the next stage. and there it is. 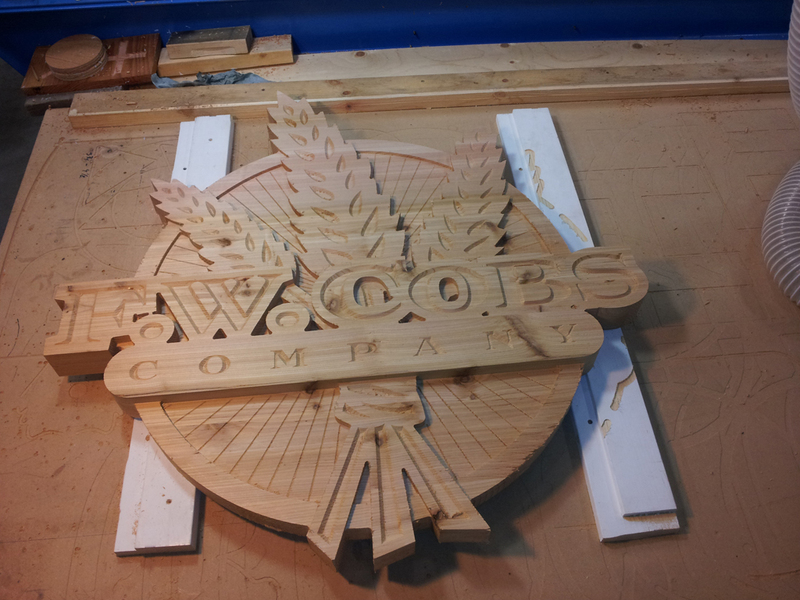 top is done. 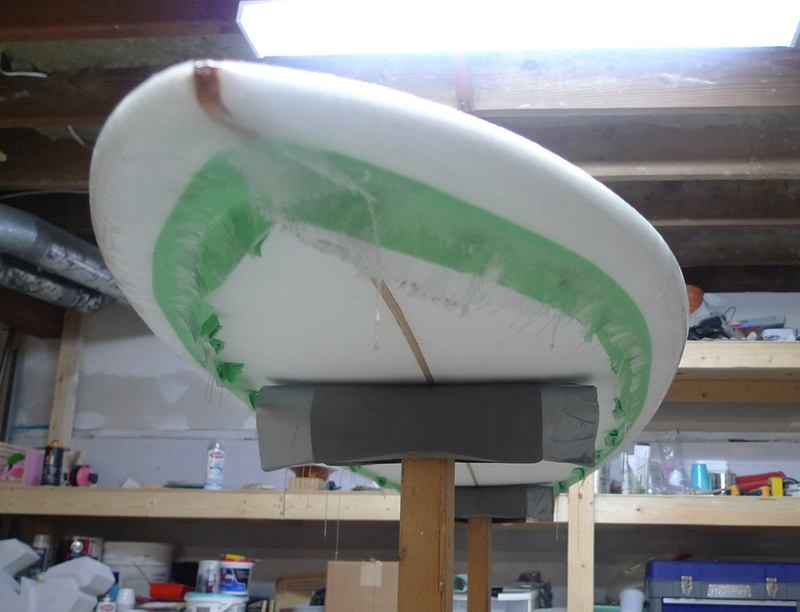 For the top laminations I went with a free lap, which when inexperienced with fibreglass, leaves all the little hangy bits of glass fibres smeared along in every which way on the bottom of the deck. It was a real pain to sand them out before painting.. next time I think I will try another cut lap for the top laminations. it's more work initially, but in the end it would have saved me some time, and yielded a much cleaner result along the bottom rails. stay tuned, next update is paint and polish! Part 3. Paint and Polish. Just a quick Posting today. 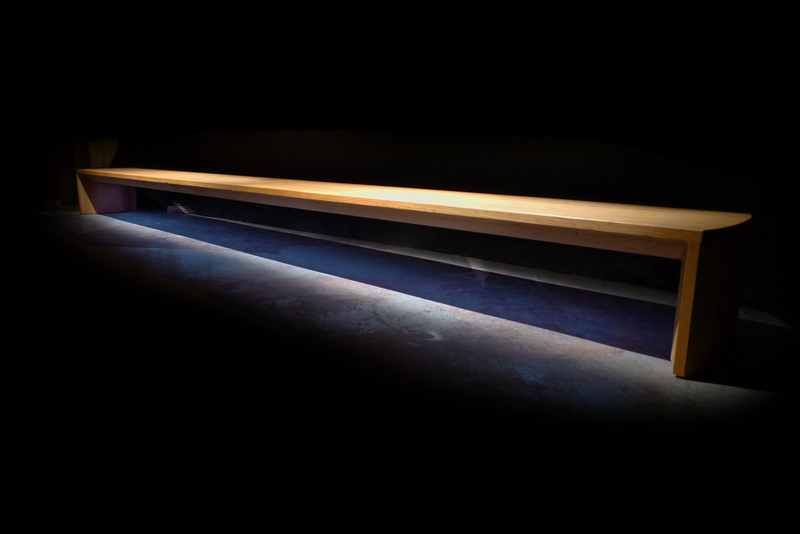 Zack Lazarus at Lazarus Productions shot and edited this fantastic promotional video of the ONE6 bench. 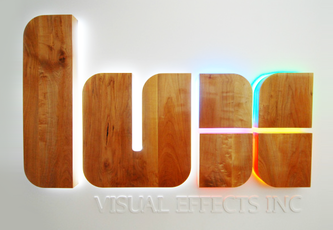 This went along with our application to the 2012 Core77 Design awards, which we will find out about in June. 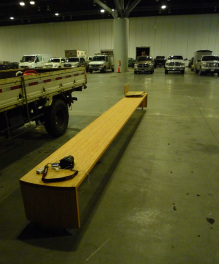 We transported the bench to the Vancouver trade and convention centre on a flat deck truck with a Hiab hoist. While there the bench enjoyed a really good reception. 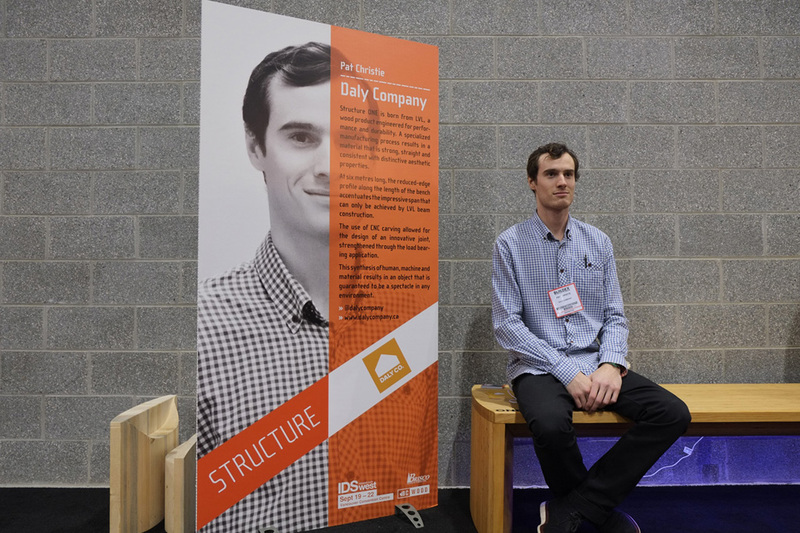 During the entire trade show, there was always someone sitting on it, Using their phone or drinking a coffee, just taking a break from the rest of the show. We made a few really good contacts with architects and interior designers. 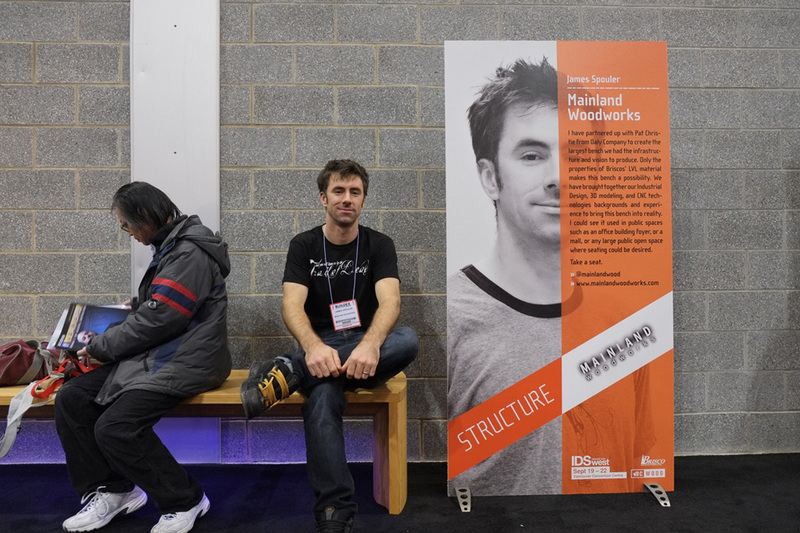 Some expressed interest in buying one or two or three, others gave us some tips on who to talk to about getting this bench where it belongs, in large scale, public spaces. All in all, it was a great experience and we look forward to where this is going to go. 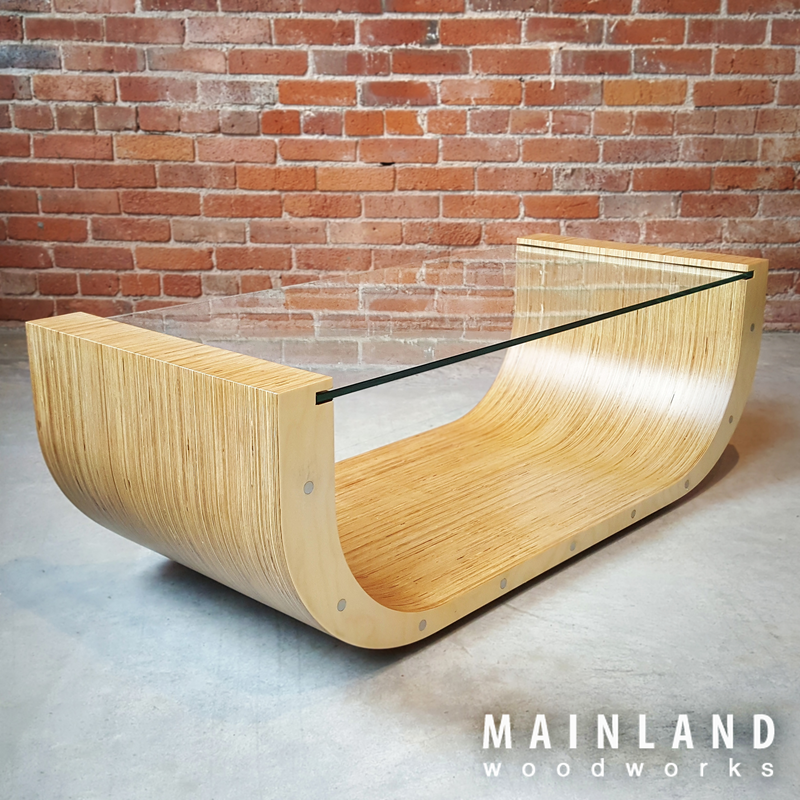 The next steps for the ONE6 are entering it into the Core77 design awards, moving the bench to it's next home at #1 Noodle House on Cordova and Carrall, and then to the IDSWest trade show for 4 days in September. 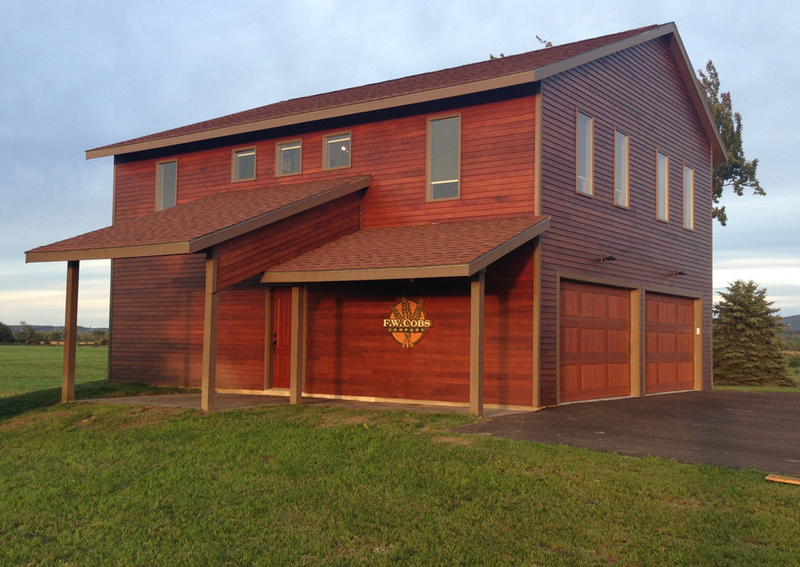 Completion of the CNC work meant it was time for finishing at the OGA Design shop where Daly Company has shop space. 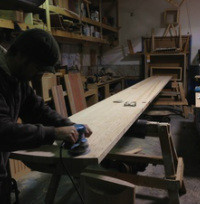 Preparing for the bench’s arrival, Pat had researched different methods of finishing. 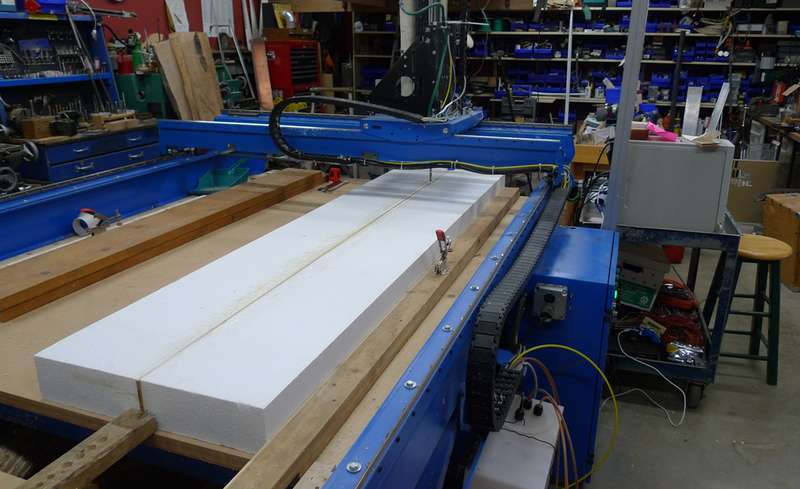 We learned there are numerous products on the market well suited for our application. 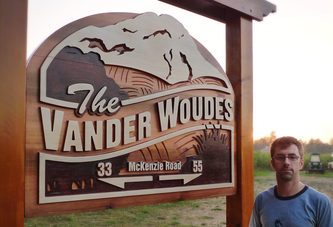 However, John, of local Windsor Plywood, stressed the importance of picking a product most suitable for the process. 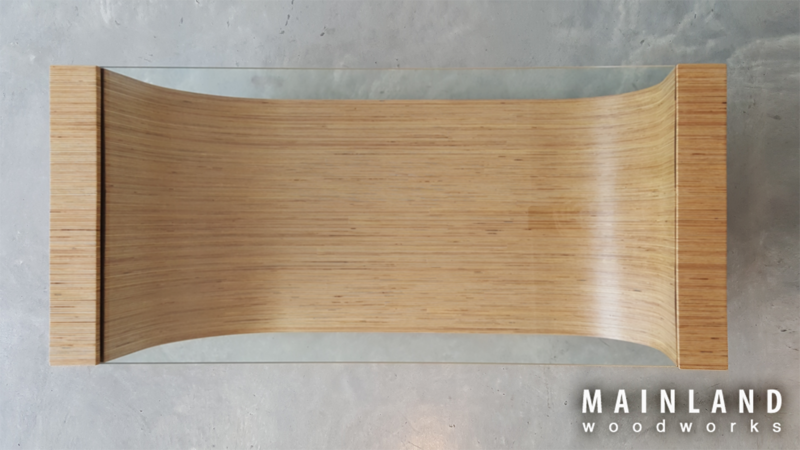 Since we don't know the future home of our bench, we wanted to pick the most versatile product. We decided on Penofin Red Label containing Brazilian Rosewood oil that penetrates and protects against moisture. The oil adds color to the Douglas Fir based LVL and has UV protection to minimize fading. 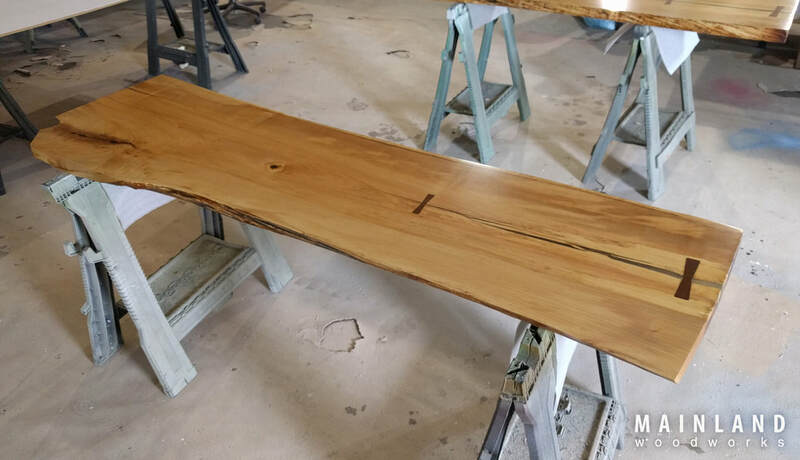 Before applying the finish, we sanded, fitted the legs, caped the sides and installed the four metal pegs that hold the entire bench together. 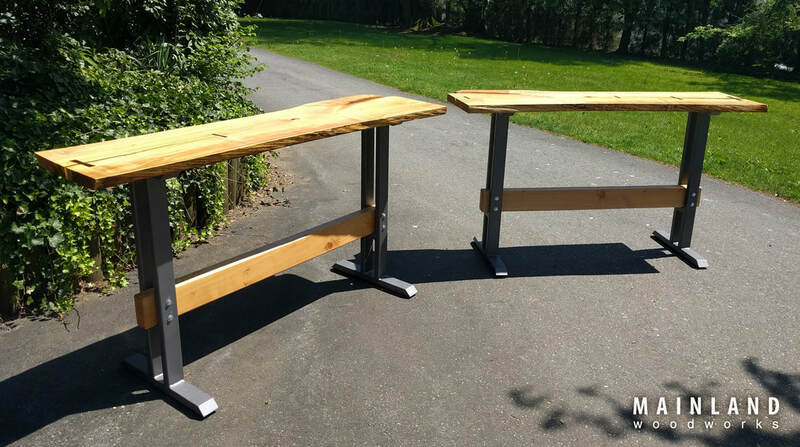 In a discussion with Art Paul of Permanent Pole, we reached a solution to hold the bench together with the least amount of materials and no glue. 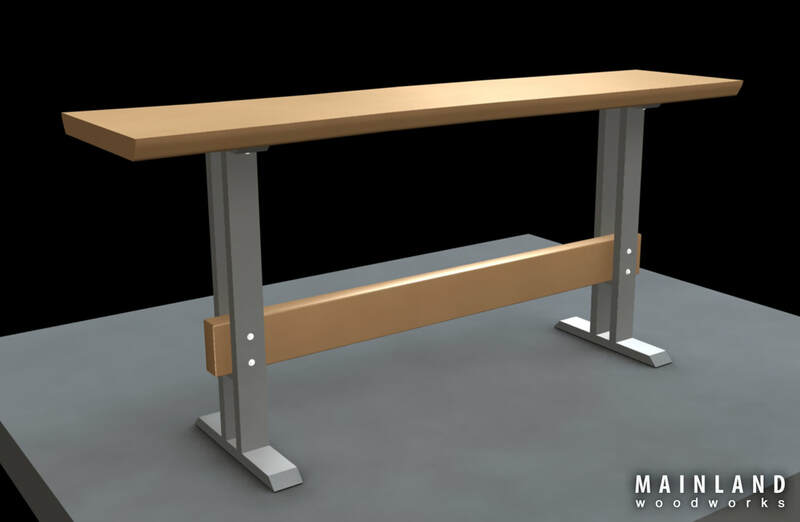 The joint we designed only needed two metal pegs, bored into the legs and aligned with holes on the top piece for security. Accuracy of these holes was crucial. 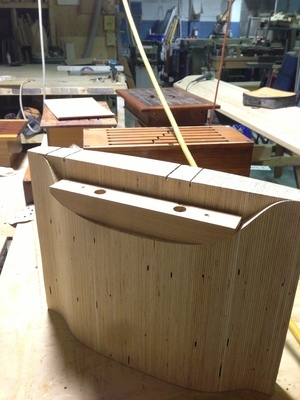 Pat built a jig for both pieces to ensure the holes aligned perfectly. 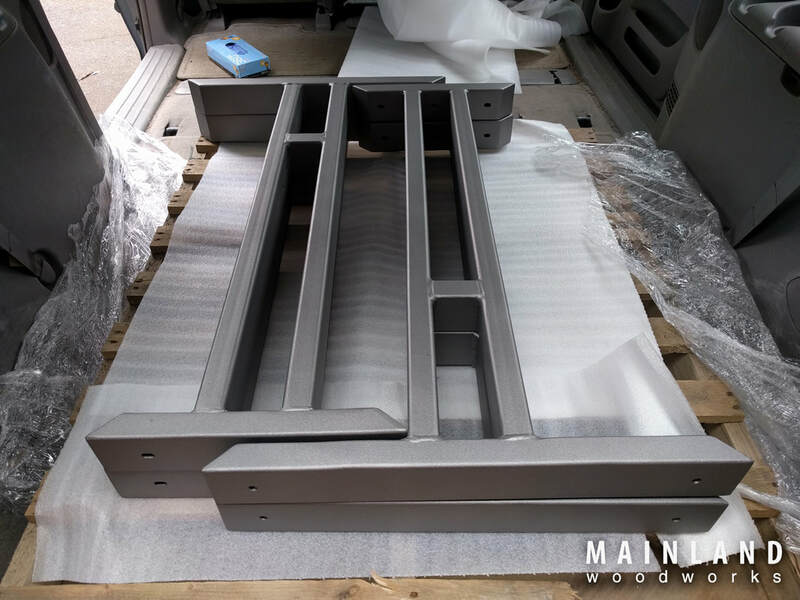 To streamline the process in the future, We will cut the holes in the CNC process to avoid having to ‘fiddle’ with the holes for correct size and increased accuracy. 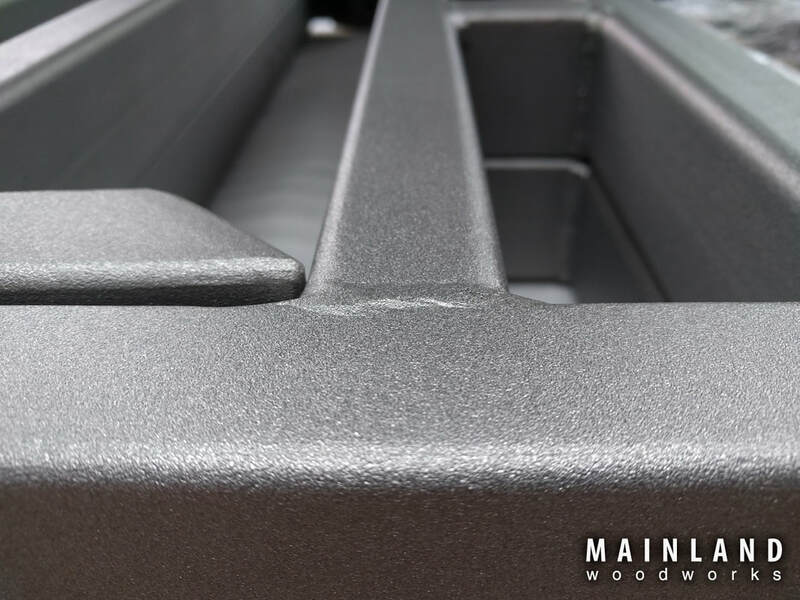 The application of the finish went smoothly and we’re really satisfied with the color it gave to the LVL. We gave it a final coat of wipe on poly for an added layer of protection, and to achieve the satin finish we were looking for. 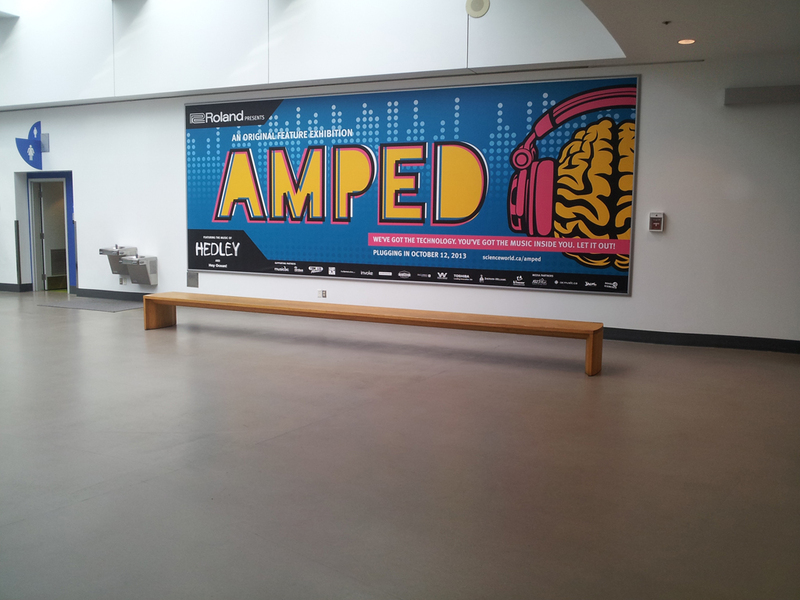 All that’s left is to install the color changing LED's, to the underside of the bench, and transportation to Buildex 2013 at the Vancouver Convention Center. 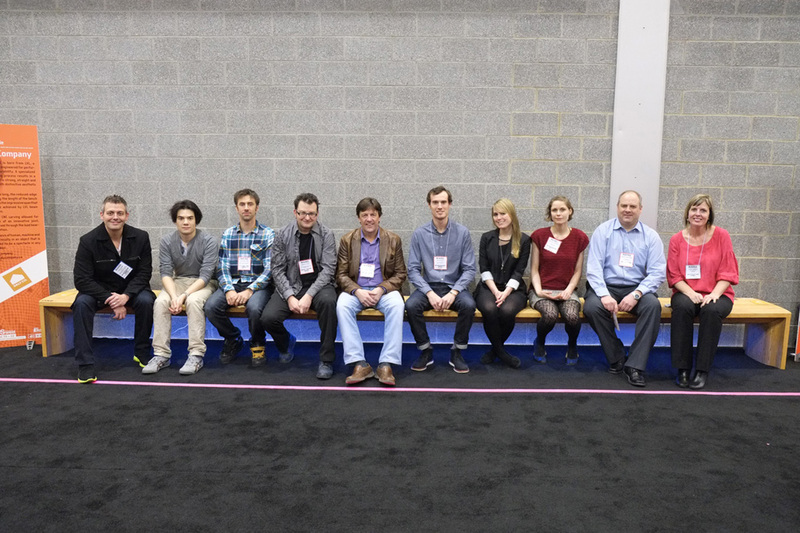 The bench sat at the STRUCTURE program in the IDSWest booth February 13 - 14.